There are three kinds of moth commonly found as pests in the home – the clothes moth, the brown house moth and the white-shouldered house moth – which cause damage to clothes, carpets and soft furnishings made from natural fibres. Smallest of the three, the adult clothes moth is a uniform pale gold colour and has a noticeable reluctance to fly, tending to scurry rather than take to the wing. This kind is the main culprit when it comes to ruined fabrics. The white shouldered house moth can be told apart from the clothes moth by the white head and shoulders which give it its common name, while the brown house moth is mottled and darker and is frequently found in kitchen cupboards and bedrooms. Moths can be a serious pest especially in large numbers, when they can be very destructive. Although the adults have a very short lifespan, typically only living for two or three weeks, the caterpillar stage last for up to six months – and it is these hungry, growing grubs that do the damage. 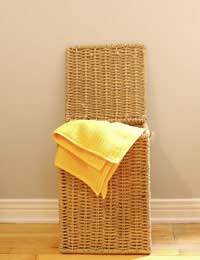 Protecting your clothes, upholstery and fabrics may often involve a mixture of prevention and cure. The eggs are laid amongst suitable fibres, subsequently hatching into white-bodied caterpillars with brown heads – and healthy appetites! Fully grown and having eaten their fill, they form a pupa within a silk cocoon, from which the adult will eventually emerge. Generally only one generation is produced each year, but where conditions are favourable the moths may breed more frequently. Good housekeeping is a major weapon in the fight against moths. Frequent vacuuming will reduce the likelihood of carpets becoming infested – and there are moth-proofing treatments available which may be appropriate for particularly valuable or susceptible ones. The caterpillars often congregate under heavy furniture, so this needs to be moved and checked periodically if moths are suspected. A good general de-clutter, if appropriate, can also pay dividends by reducing the number of places both adults and larvae can hide. Clothes and other fabrics which have food, sweat or urine stains are particularly attractive to moths, so regular washing or dry cleaning will help as will careful storage of items made of natural fibres, perhaps in sealed plastic bags or securely closed boxes. Residual insecticides are effective against these pests and a variety are available for sale, some with cypermethrin as the active ingredient, others which are based on vegetable extracts. Where a wet spray cannot be used, fumigation products can offer a highly successful alternative, particularly in lofts or store rooms, while aromatic red cedar wood makes a natural alternative to traditional moth-balls for wardrobes and drawers. The most up to date method, however, uses the moth’s own sexual chemistry against it. Female moths use special scent chemicals – called pheromones – to attract a mate and the males can detect the smell of a waiting female with amazing accuracy over great distances. Many products are now available which make use of this, using pheromones as bait to lure males into a sticky trap – the idea being to break the breeding cycle, thus controlling the infestation. Although they do not pose a threat to human health, the potential damage that these pests can do to fabrics inevitably makes them one of the least welcome insects in our homes. However, with a measure of good housekeeping, combined with some simple preventative measures and suitable pesticides as a back-up, we should be able to make sure that our soft furnishings and favourite garments are not about to be destroyed. Thanks for the info Dr Evans, here's hoping that I get this problem sorted - the sooner the better!! !